What happens if you are ill while chartering a superyacht? No one wants to think about a medical emergency when planning a luxury charter but the good news is that superyachts are well prepared when it comes to the unexpected. All charter superyachts are well equipped and trained to handle medical emergencies and modern electronics such as satphones can bring both advice and aid quickly. All superyacht crews are required by maritime law to have basic training in first aid and many members of crew have the equivalent of paramedic training as well. All superyachts have sophisticated medical kits that often include oxygen tanks, defibrillators, specialised medications and intravenous fluids. Many charter yachts belong to a round-the-clock “telemedical service”, which is a dedicated provider that links the yacht directly with an emergency room doctor via a satellite telephone. These services usually equip the yacht with a comprehensive medical kit that is refilled and updated regularly, so the doctor knows exactly what is available. In some cases, the yacht may even be equipped with monitoring devices so the doctor can read any vital signs thousands of miles from the yacht. Since the doctors are often based in a hospital emergency room, specialists can also be called upon if required. 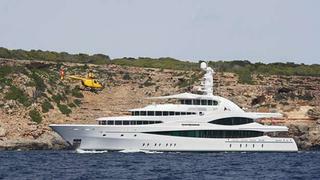 In serious situations the yacht can arrange a medical evacuation by helicopter. Depending on the patient’s desires it can also be possible to arrange for private jet transportation to a hospital of choice. What are the most common medical problems? The most common medical issues are gastrointestinal (too much gourmet cuisine), ENT (ear/nose/throat) problems brought on by swimming, and sprains or trauma caused by falls. Seasickness can also make some passengers feel unwell (Link to new sea sickness page). To make the most of the medical services a potential charterer must be clear with the broker about any known or suspected medical problems and any special medications required. Your doctor should be consulted before departure to make sure that none of your regular medications could be affected by excessive heat, sun, or insect bites.